Here’s a list to take to your local plant nursery. Many indoor cats love to nibble plants, but what’s a home without plants? My friend Shenandoah had a good idea: Just tell me which plants are safe for cats so I don’t have to worry about this behavior. 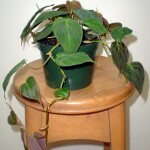 Most plants can weather some nibbling. TIP: Some people find it helpful to spray Grannick’s Bitter Apple Spray on a houseplant for a few weeks so that your cat is deterred and decides to leave them alone thereafter. 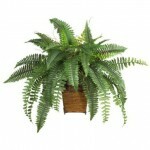 You and your cat can enjoy the Feng Shui and air cleansing of this lovely greenery in your home. Note: Too much of any plant may make a cat vomit. Use caution. 1. Most types of ferns are safe….Boston Fern, Sword Fern, Button Fern, Cliff break fern, Mother Fern, Carrot Fern and most other ferns. With ferns, according to the aspca database, you need only avoid: The very toxic Cycads (not really a fern, but also known as “Fern Palm” and Sago Palm) and the mildly toxic Asparagus Fern (aka Asparagus, Emerald Feather, Emerald Fern, Sprengeri Fern, Plumosa Fern, Lace Fern, Racemose Asparagus, Shatavari, Asparagus densiflorus cv sprengeri). This is that tall bamboo you see used as screens indoors and out, as shown here. 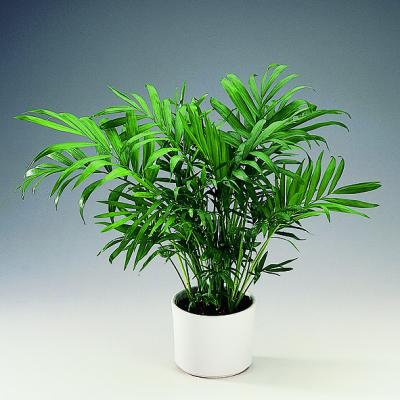 **IMPORTANT: Do not confuse the above bamboo plants with with the toxic plants “Lucky bamboo (Dracaena sanderiana)” and “Heavenly Bamboo (Nandina domestica)” — neither of which are lucky or heavenly for cats! There shall be no nibbling on these common plants! If you think you may have a poison emergency, immediately contact your vet or or the ASPCA 24-hour emergency poison hotline at 1-888-426-4435. 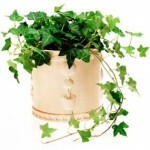 Avoid all kinds of ivy. CAT TIP: Sometimes indoor cats just really seem to be obsessed with eating something green. I think they are craving grass. The chlorophyll is cleansing and may even help prevent cancer. When we have cat grass around, our cats don’t seem so interested in the plants. 27 Responses to Which plants are safe – and not safe – for cats? According to the Page you linked for the heavenly bamboo, which does say it’s toxic for plants, it also says what is considered lucky bamboo to be safe or nontoxic? What is your source for the lucky bamboo? Please include peace lily’s on this list. my cat got REALLY sick after i moved into a new apartment with some and he had a few snacks. Putting it out of reach and buying some cat grass fixed the problem, he still sneaks snacks of the bamboo, but what are you gonna do? I just caught my “Valentine” about to eat my aloe Vera plant. I didn’t know if it was toxic or not. I just said no no very loud to her. Luckily i did because it is poisonous to felines. I love instant information. I noticed that Tiger Lilies are on the list. They are extremely hazardous to cats…I once had to rush a cat the vet after a brief exposure. you are so correct! We mention this in the flowers post. I was not considering tiger lilies a house plant. First of all, it’s wrong to keep nonhuman animals as pets. I’m all for adopting and rescuing captive cats (who are often forced to live in appalling conditions), but am against further domestication of animals. Cats, like anybody else, like to go outside, explore, and do what they want. Keeping anyone indoors all the time is unnatural and cruel. I am caring for two rescued cats who live with me. I let them use the yard and go in and out as they want. I would never think of keeping a cat in a tiny apartment, at least not permanently. I like the plant ideas. I am going to buy some bamboo plants to put in my house. I have a cat that was rescued from the outdoors and spayed and then we found out she is FIV+. I want to let her explore so badly but am afraid she might infect other kitties. what’s your stance there? Cruel? You can be against the domestication of animals, but I hate to be the one to tell you that cats are already domesticated. Even feral cats are breeds of domesticated cats. They still have some species in Europe that are not, but not in the US. Believe it or not, some cats enjoy being inside. I had a cat for 12 years that I got from a shelter, who was found as a stray, that wouldn’t go outside if I left the door wide open. She liked her air conditioning, her fleece blankets, her toys, and always knowing she had food and water. During that time she also was my only companion at certain points. If she hated her life, she really didn’t act like it. During this time I became disabled and she was like a therapy animal for me. I loved her unconditionally and losing her was beyond heartbreaking. You can share you opinion , but you don’t have to be so self righteous, not everyone’s story is the same. Among the herbs that repel cats are Rue, Canina, citronella, lavender, rosemary, lemon grass oil, citronella oil, eucalyptus oil and mustard oil.Anise, Bergamot, Castor,Calendula and Chives. Cats should stay away if you plant them as a border around your flowerbeds or intersperse them among the other plants in your garden. You might want to reconsider your safe rating of spider plants. They can cause nausea in cats and after vomiting frequently a cat might stop eating and then dive headlong towards death. I’ve lost one cat to that and had another come close before removing the spider plant. Be on the safe side: keep spider plants out of cats reach. Blessings Doobie Keebler, thank you for the heads up for Spider Plant. I removed the plant as yes Daisy May had a smallnepisode after just munching on a small leave, but thankfully she is fine and checked over by her vet. Plus, since we have removed the Geranium with is lethal as is Aloe Vera plants so they have been banished from her reach and taken down to our greenhouse. We have now a main list of 10 herbs which are for happy and healthy cats, and most of them are bought from Abbeybotanicals in amazon, chamomile, burdock n valerian. and seedong some Echinacea, and plamted Lanender, Rosemary, Oregano and Parsley. And she loves her Green Beans and Carrots too. Thank you again for the heafs up. I will pass this information about Spinder Plants on Daisy’blog. Blessings. Doobie, thank you for sharing your experience and warning here about the spider plants. APSCA says they are “not known to be toxic but too much of any plant can make a cat vomit.” But, if you lost a cat after they ate that plant then that is indeed a concern! Thanx for the list of plants – safe and unsafe. We have a lot of Spider Plants in the house. Our cats love to chew on them. I’m always bringing grass inside during the non-winter months. The fiber cleans out the hairballs and tones the gut. The minerals and chlorophyll is really good for them too. They love the smell and taste of grass. Yeah, Ivy is really bad. 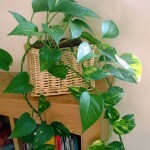 Didn’t know Pothos was toxic to cats. Glad you tipped me off. Apparently Aloe is pretty toxic. I also read on your FB page that Essential Oils are toxic to cats. I have been using a combination of Tea Tree Oil, hydrogen peroxide and Biokleen as a general household cleaner, thinking this was safe – YIKES! I want to use something for disinfecting. Do you think it’s OK to just use straight hydrogen peroxide? Or, I wonder if Clorox Anywhere is OK… the active ingredient is Sodium Hypochlorite – 0.00095% and it has chlorine as 0.009%. It doesn’t say what the “other ingredients” are, however… the bottle says it is safe to use around kids, pets and food. Hi Julie, thanks. Yes, there is a strong consensus that tea tree oil is not safe for cats. I was surprised and had used it a lot before too! 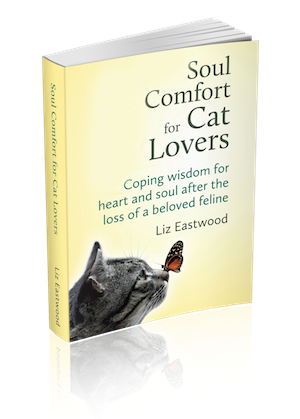 Cats are just so special and sensitive because they lack a certain detoxifying enzyme. A mixture of vinegar and water is considered safe and cats don’t like the smell of vinegar so will avoid it anyway. It also is antibacterial and cleans just about anything. If you do use something with an iffy substance like hydrogen peroxide in an area the cats are like to walk, just wipe it down really well with water. But in general avoid any substances with essential oils in cat areas. Wow, am surprised that chemicals are in the house but hey, which are deadly to a puss cat! You can get a pet antibacterial spay from sainsbury’s called PETFACE Disinfectant Spray which kills 99%.99 bacteria and viruses including kennel cough, canine distemper and parvo virus. 24 hour germ protection. Neutralizes odours and leaves a fresh, clean scent. Suitable for aeras where pets live, sleep and feed. Ideal for cleaning cat litter trays and small animal cages. I use this product on all my floors and where Daisy May goes and would not use anything else. Kitchen floor and bathroom too. And I keep antibacterial hand wash and hand rub in the kitchen and bathroom. The only poisnous chemicals I have in the flat is for the loo which is locked away so puddycat paws cannot reach. You can also pick this product at Pets At Home, as well as Sainsbury’s main supermarkets. You can add to your online shopping. I think it was £2.99 ish. I hope this helps. Blessinsgs. Thanks for the pictures!!! I went to so many sites and they just had the names-hundreds of names and I wasn’t going to look up every name to find a picture. So this was very helpful! Thanks!